Father Dat Vuong, Yangebup Parish Priest, consecrates the Holy Eucharist in the assembly hall of Hammond Park Catholic Primary School. Photo: Matthew Lau. From this month onward, Mass will be celebrated at Hammond Park Catholic Primary School every Sunday morning after much demand from the Yangebup Parish community. Previously, a Mass service was held in Hammond Park on the first Sunday of each month in the school hall. Hammond Park is one of the suburbs highlighted for great potential in the “Growth and Development” section of the Archdiocesan Plan 2016-2021. Renay Grech, Archdiocesan Manager of Strategy Implementation and Support, confirmed the latest increase in progress to The eRecord. “The future and what develops will depend on how well the Mass is attended as well as other factors,” Mr Grech said. Assistant Parish Priest Fr Joseph Laundy celebrates Christmas Eve Mass in Hammond Park. Photo: Robert Tay. Yangebup Parish Priest Fr Dat Vuong said he has noticed a considerable increase in demand in the suburbs south of Mater Christi Church. “Hammond Park Sunday Mass is an expansion of our service here at Mater Christi,” he stated. 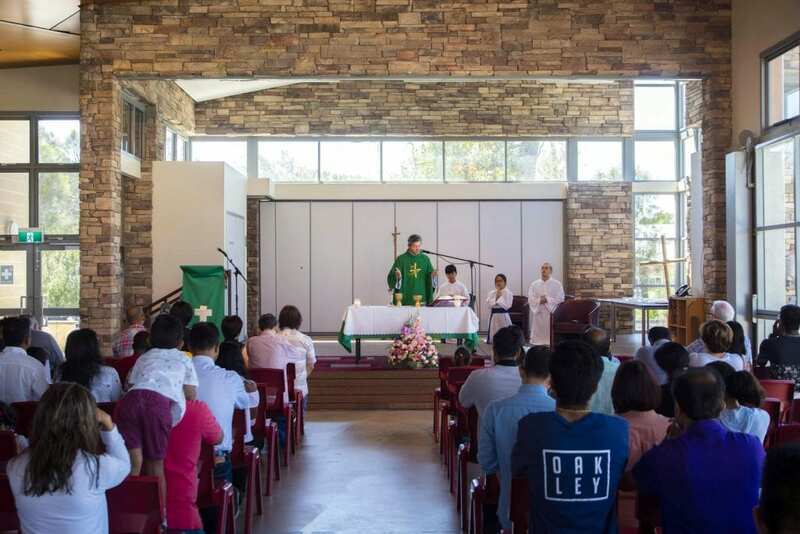 Fr Vuong made the announcement across all Mass services at Yangebup Parish on the weekend before Christmas, and at a special outdoor Christmas Eve Mass service at Hammond Park. “We want to further that service more weekly rather than monthly, because that’s how we build community. “Hopefully one day, God-willing, the Archbishop may bless us with a new Parish Priest and it becomes a new parish, following the footsteps of current developing parishes such as Baldivis and Banksia Grove,” he added. Yangebup Parish is ever developing and has now gone from hosting a Mass service once a month to a weekly basis. Photo: Robert Tay. Fr Vuong thanked HPCPS Principal Chris Cully for allowing this happen, and for the use of the school’s equipment. Aubin Grove resident Mary Tan has been involved with Mass in Hammond Park since its inaugural service on 1 September 2013, held in a staff room and celebrated by then-Parish Priest Fr Bryan Rosling. Mrs Tan coordinates the roster for the liturgy and is part of the logistics team who ensures the school hall is set up and packed down for each service. Some 150 parishioners regularly attend Mass at Hammond Park, she said, and is held in a venue that gives the community a more “family-orientated feel to it”.